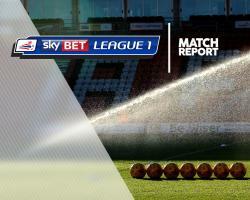 Sky Bet League One promotion rivals Bradford and Sheffield United had to settle for a point each from a 3-3 draw after serving up a six-goal thriller at Valley Parade. The visitors went in front in the 18th minute when Mark Duffy delivered a cross from the left over the head of Nathaniel Knight-Percival, with leading marksman and skipper Billy Sharp scoring with a close-range header off the underside of the crossbar. However, Bradford hit back to equalise in the 35th minute when the visitors' defence failed to cut out Matt Kilgallon's low cross from the left and unmarked Billy Clarke scored with a shot just beyond the far post to leave the sides level 1-1 at half-time. Duffy played a free-kick from the left deep into the Bradford goalmouth for the on-rushing Sharp to score from close range. United failed to clear a corner and when Josh Cullen lobbed the ball back into the goalmouth James Hanson played the ball across the face of goal for Hiwula to score at the far post. The home side took the lead for the first time in the 68th minute after Kilgallon's left-wing cross was turned into the far corner of the net by Timothee Dieng. The lead lasted a mere four minutes as, when the Bradford defence failed to clear John Fleck's corner, Chris Basham scored an equaliser with a shot at the far post to extend the Blades' 10-match unbeaten run. Both sides tried to force a winner, with Bradford going closest five minutes from the end when Hiwula saw his shot rebound off the crossbar.